You are here: Home / Articles / Can Swansea seek Promotion after THAT transfer window? When clubs get relegated from the Premier League, the ensuing transfer window usually hits them hard. Swansea City were hit particularly hard this summer. Although the club pulled in a fair amount of cash, Alfie Mawson, Lukasz Fabianski, Federico Fernandez, Sam Clucas, Roque Mesa, Kyle Bartley, Andre Ayew, Jordi Amat, Sung-Yong Ki, and Jordan Ayew. This has left manager Graham Potter with a starting eleven that’s wildly different to the one fielded last season. Naturally, this had an impact on Swansea’s chances of going back up to the Premier League at the first time of asking. Stoke City and West Bromwich Albion managed to hold onto much of their squad and make some key additions, so they’re among the favourites to go up. Leeds United have become the favourites after a blistering start, while the likes of Middlesbrough, Brentford, and Aston Villa are also in the hunt. Swansea sit quite far back in the chase for promotion, according to the oddsmakers. But, after a decent start to the campaign, can the Swans defy the odds, and from there, could they even aim to bring back a player that they lost should they achieve promotion? 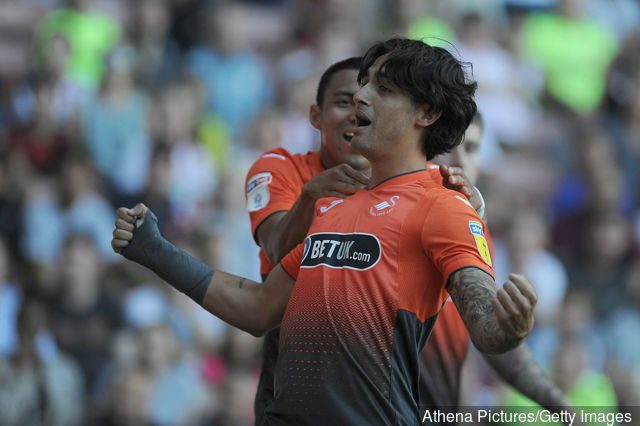 In their first game back in the Championship, Swansea travelled to play Sheffield United. The first half saw Swansea play with caution, trying to temper the crowd. Shortly after the hour-mark, the Blades went ahead, undeservedly so at the time. But, the goal merely inspired Swansea to press their agenda. 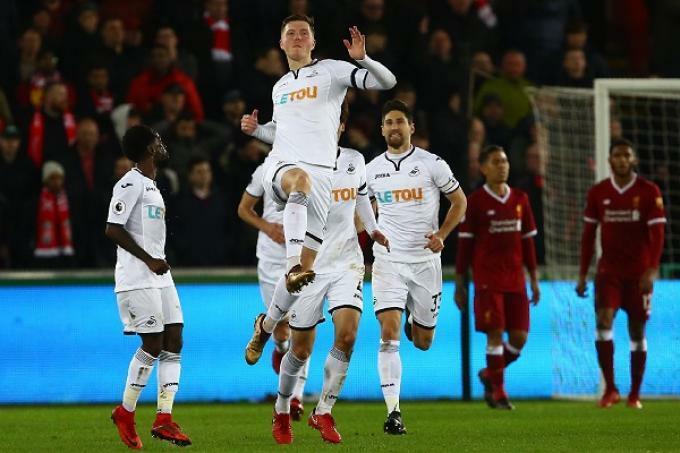 Less than ten minutes later, 22-year-old Oliver McBurnie equalised, with Liverpool loanee Yan Dhanda scoring the winner with five minutes to go. It was a strong display, and certainly gave the new boss a better idea of the potential within the squad. Then Swansea played Preston North End at the Liberty following the conclusion of the transfer deadline. While the team had been ravaged, at least no one else could be sold until January. Potter’s squad put in an accomplished performance against Preston; McBurnie saw his penalty saved, but Jay Fulton made up for it before half-time. Swansea’s ability to control the play with some excellent passing in the first half, was in contrast to the defensive qualities shown in the second, which led to them having 42 per cent possession overall, but was enough for them to land two wins from their two opening games of the season. Swansea have been able to control their opponents with their superior passing play which has led to a fair number of chances. As Potter likely hasn’t found his favoured starting eleven yet, this start to the season has been impressive, and it appears to be a more durable approach to each game than Leeds’ gung-ho mentality. Could Swansea re-sign a fan-favourite? Andre and Jordan Ayew are only out on loan, and so they could return to Swansea if the Swans achieve promotion but, more importantly, if Fulham get relegated, as they’re expected to at 2/1 in the Premier League relegation odds, Alfie Mawson may be back on the market. Mawson was very impressive for Swansea during his time in Wales, leading to many potential suitors in the top half f the Premier League. He was also named Swansea’s young player of the year during his first season in England’s top division. The centre back’s consistently strong performances made him a fan-favourite, and was one of the hardest players to see leave in the summer. However, in selling him to Fulham, Swansea may have hatched a cunning plan to potentially get back their star man after a year’s hiatus from the Premier League. If Swansea can defy the odds and achieve promotion while Fulham live up to their billing, Mawson may be available for another switch back up to the top flight, and being relegated two years in a row would likely lower his price. A lot would have to fall into place, but there is a slight chance that Mawson could return to the Liberty. The focus, for now however, has to be maintaining their strong play and finishing in a top-six spot.